Even our pediatrician and neurologist couldn’t answer the question. How much fish oil is good for my little ones? I probably worry too much. But increasingly, as my little ones become bigger ones, I wonder about their brain development. They are all strong in the vocabulary department. It’s the pronunciation that eludes them. For example, one of my boys says “hocks” instead of “socks”. When we say, “Ssssssssss-ocks”, he will repeat, “Ssssssss-Hocks”. It makes us chuckle but I still wonder what I can do to help it along. I have been assured that this is all normal. Okay. I can buy that. After all, I can’t imagine he will be meeting his future wife at the altar saying, “I promith to wove, honow and chairwish you . . .” It will change eventually. Since my other son had a stroke the day after the triplets were born, I figure omega-3 fish oil is probably good for him. There are plenty of articles and blogs on this topic, including information from the respected Dr. Sears. Yet none of the medical professionals our children see could answer my question. How much do I give them? The rationale for not answering was that studies are ‘unpublished’. Eventually I did get the answer. I got it straight from Dr. Mehmet Oz himself when I had the chance to briefly interview him last week. Dr. Oz is a fast talking, extremely accomplished and knowledgeable man. So I posed the question to him: What doses of Omega 3s are recommend for different ages and what are the benefits? Though he also told me that fish oil studies are as of yet unpublished, the data shows Omega 3s contribute to cognitive memory increase. Clearly this supplement has value. “Omega 3s are wonderfully effective”, says Dr. Oz.”I give them to my kids daily. They are the most important supplement you can take.” Finally! I searched around on the internet to find a good price and settled on Dr. Sears’ liquid fish oil for kids. I figure I can sneak it into their milk and then watch them and see if any changes are obvious. While I have no idea what to expect, or any idea in what time frame to expect or not expect any changes, I do know that it can’t hurt them. Their toddler language is often unintelligible to me and their math abilities consist of, “I have one and you have one, and I need the one you have so I have more”. I don’t expect them to suddenly speak multiple languages and do algebra. I guess I just hope that it gives them the brain power necessary to overcome being born so premature. My mind stretches daily from too much worry, I am pretty sure there is no fiber in my non fat lattes, but now I can rest easy that what I am pursuing keeps my heart beating (if slightly too fast). My kids keep picking fights with large, inanimate objects, against which they have zero chance of winning a fight. What to do, what to do? I wish I knew. Our pediatrician assures me this is normal behavior for almost two years old. That doesn’t stop me from worrying. 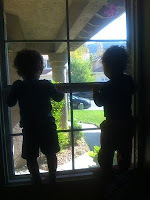 My friend Jason was horrified to learn that my kids climb into the window sill. Of course they have to get onto and over a gym mat, a mattress and a couch to get there. But does that stop them? Nooooo! If they decide they want to reach something, they will stack up toys, boxes, whatever they can find, if they are unable to climb up on to do it. Jason asked me if I have 50 heart attacks a day. Close, Jason. Close. I must say that the time period of being sleep deprived was difficult. I was tired but they weren’t mobile. Taking care of the triplets was by far easier than it is getting to be now. Today my daughter smacked her head twice and slammed a finger under a toy. The first head smack was so bad she immediately developed a one inch, purple and ever growing lump on her forehead. After the initial BOOM against the wall, the shrieking was enough to give me a headache. I carted her off to the doctor who is just five minutes from our house and had her checked out. All good. Back home less than an hour later, she smacked the side of her head. In the very same wall spot as the first crash. More shrieking. In the meantime, the boys are all over the place. One cannot yet walk, but is in a gait trainer and getting around quite nicely. When he is on the floor, he scoots pretty fast on his bottom using his feet to pull him. I can barely keep up with making sure there are cushions behind him in case he falls over and smacks his head on the tile floor. More worry. The other little guy has already had stitches in his forehead, and all three of them have scrapes and bruises on their knees and chins from running around in the yard. I know this is normal, but with three of them it just feels like so much all at once. The good news is they are keeping my absurdly low blood pressure at a ‘normal’ rate. I try to keep it light. If I didn’t I would lose my mind. The underlying stress for me is that one of the boys had a stroke the day after they were born. Despite neurological issues, he is cognitively intact and doing remarkably well! However, every time one of them falls I get huge knots in my stomach for worrying of more head injuries. Not sure if this is a common reaction for parents of stroke kids, but it’s how I feel. Sooo, not good with dwelling on the serious lest I increase my blood pressure that much more. But may I offer you a humorous comment? It’s to the point where I hear my heart going Crash! Boom! Bang! as often and almost as loud as the kids running into each other, the wall, tripping over toys and plowing their way into toddlerhood. Since were up at 5am anyway, we changed the kids and went to the mall. Yes, we took our one and a half year old triplets to the mall on ‘Black Friday’. Before you tell me we’re crazy, please remember that we have been functioning in a sleep deprived haze since the kids came home. Granted we are getting more sleep these days, but having triplets and a 13 year old, well, it’s all crazy making. So what difference could there really be going to the mall on this, the grandest shopping day of the year? The answer is, none. It was actually tamer for us to have the kids in strollers and wander through the mall than it would have been to stay home and follow our regular breakfast routine. When I take the kids anywhere, they are usually pretty reserved, whereas, at home, they scream and romp like little banshees on crack. They climb into the window sill, they fight over toys, steal each others’ bottles, and various other energetic activities that leave me breathless and breaking a sweat. Good thing too, because I no longer have time to go to a gym. Anyway, the point is, they are fairly calm in public, and I am happy that it is this way and not the other way around. So as we ‘braved’ what we expected to be a mob scene, the kids quietly observed the environment, taking in all the shoppers, lights and letting out a steady stream of “Uhhhhhhhh” whenever the strollers went over bumps and tile cracks. Surprisingly, though probably not good for the retailers, the mall was about as busy as a regular Saturday afternoon, except it was 6:45am. Now, I don’t shop much as it is, and if I did I would likely not be doing it in the middle of a crowded weekend afternoon. I would definitely not be doing it at this early hour ANY day. Maybe if I was single, in my 20s or something I would get up that early. But for the life of me at this point in my life, I would not actively choose to get up to go shopping at this hour. We chuckled as we looked at the checkout lines. Some were a bit long, but the stores were not overcrowded. We didn’t buy anything, but browsing was easy. We often take two strollers out when we go out with all the kids, and it almost feels like we are incognito as people tend not to notice a single baby or what they think are twins. When we go out with our triple stroller it’s as wide as golf cart and hard to miss. We ambled along, sipping our coffee, took our time, and had fun. It was great people watching, and interesting to see how many people were dressed up, made up and milling around. Lots of teens being dropped off by parents who I would guess went home to go back to sleep. One woman come out of a store with more bags than she could reasonably carry and shuffled off to her car. I wondered aloud if she was dropping them off and going back in for more. Before we left my husband decided he had to have Chinese food (for breakfast?) and asked me to drive so he could eat it. The kids could smell it and all they had was their milk. Sorry babies. I had zero appetite for Chinese food at 8am, but, to each his own. On the way home we drove past a furniture store, let me repeat that, a furniture store, where we saw a line that went all the way down the side of the store in the parking lot, and had a police car parked near the door. In case of a fight breaking out? Because the ottoman wars are all too common in the suburbs right? Also because it’s so likely that someone will run out the door with a sofa. Honestly, this was probably one of the most pleasant shopping experiences I have had in a long time. Of course, we didn’t spend any money, didn’t stand in any lines and we were out the door by 8am. When I shop online at home I can barely make it through scanning a page for anything for all the crying screaming and general mayhem. Hmm, maybe this should be how I shop from now on . . .
From now on when I need a break from the noise, I will consider going to the mall.